Symbol Creation “File”, “Open”, “Devices.DDB” This is the Device Database file which hold all schematic symbols for Tina. 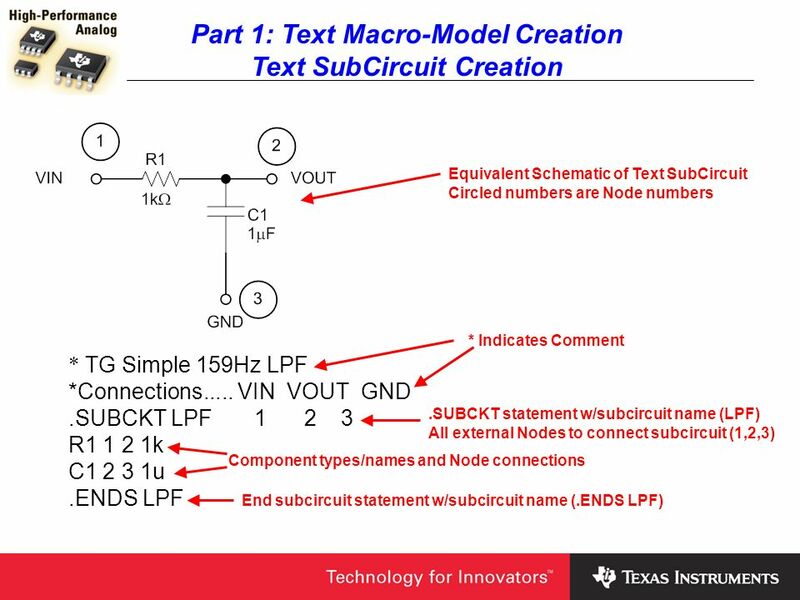 2 3 Hidden Pin Numbers * TG Simple 159Hz LPF *Connections..... VIN VOUT GND .SUBCKT LPF R k C u .ENDS LPF Ensure “Pin Order” matches the order in the Text SubCircuit. If not re-arrange the pin order using the up and down arrows until the pin order is correct. “Add Device”, Add the new symbol to the list at the right. 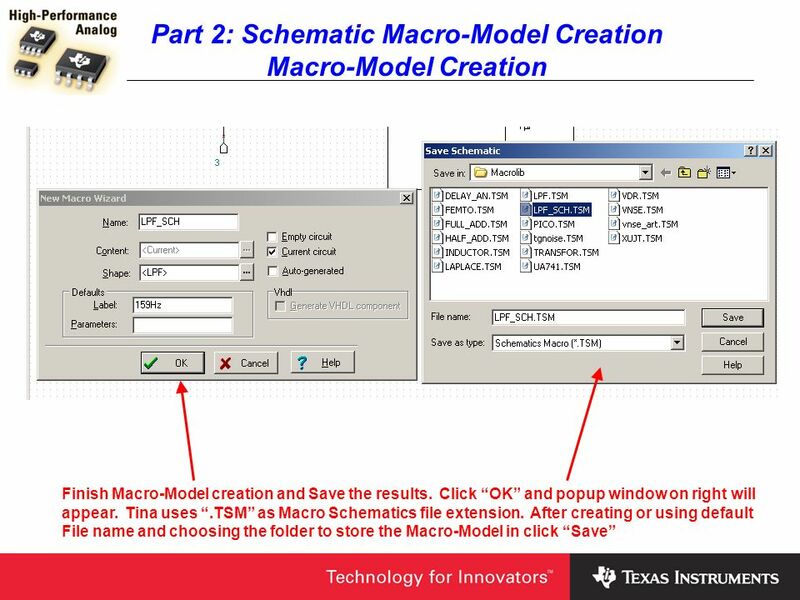 Use + button or drop down menu. 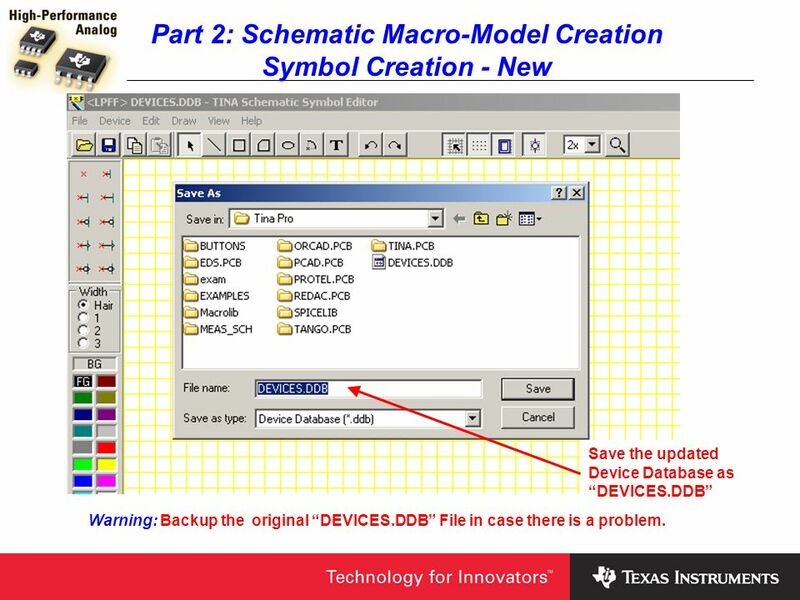 Save the updated Device Database as “DEVICES.DDB” Warning: Backup the original “DEVICES.DDB” File in case there is a problem. 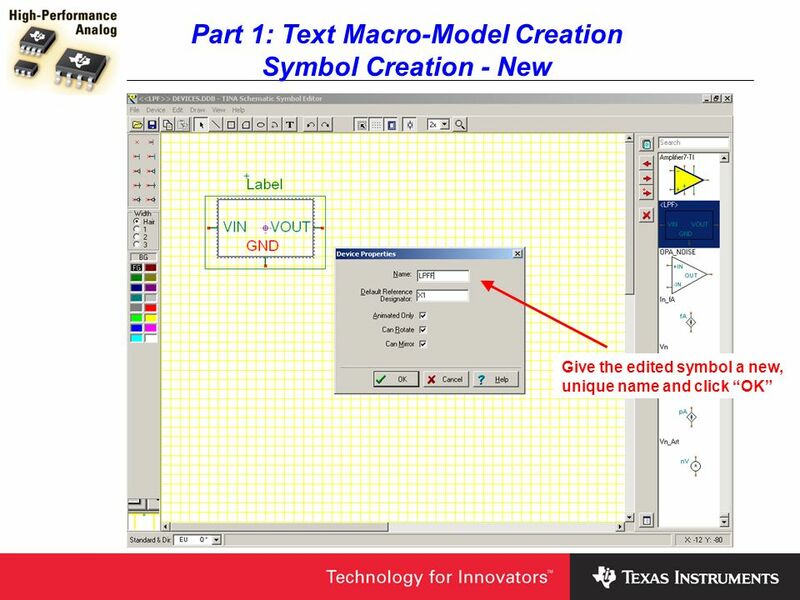 Symbol Creation - New Create desired outline for symbol. 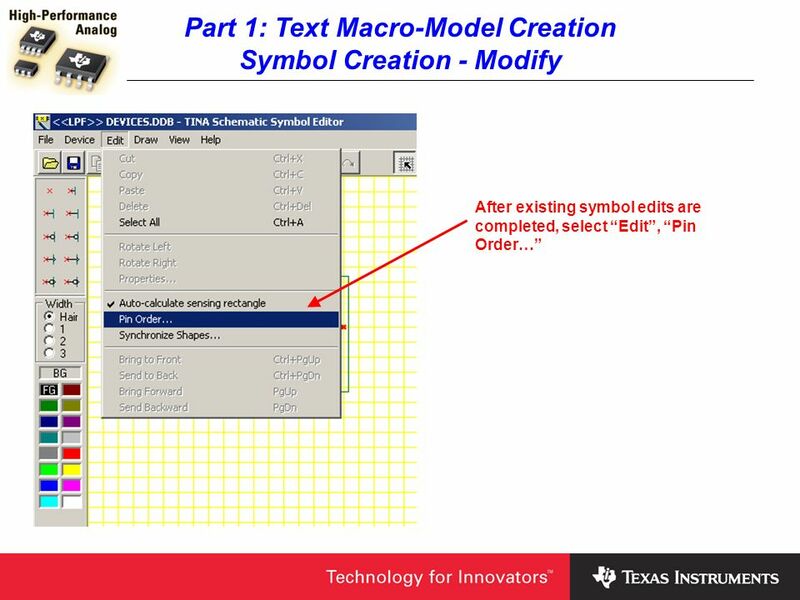 Keep grey “crosshair arrows” and “+ circle” geometrically centered inside of symbol outline. 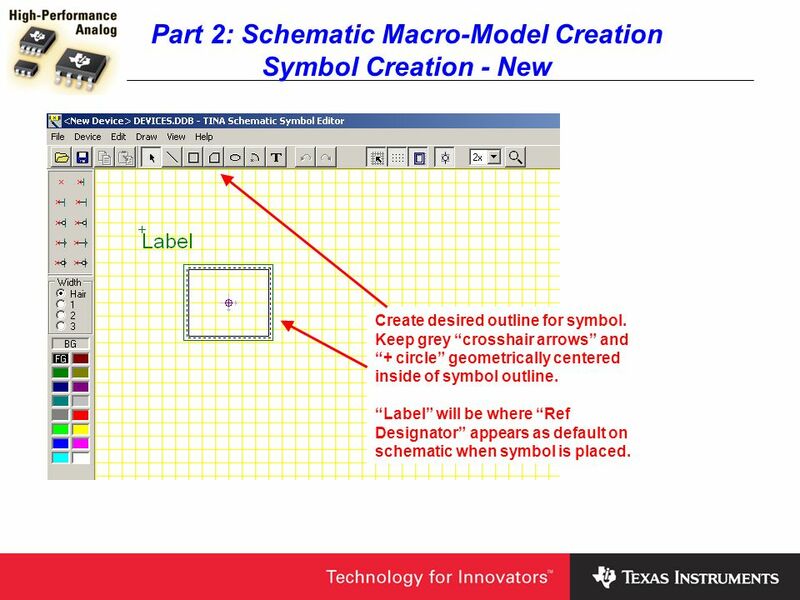 “Label” will be where “Ref Designator” appears as default on schematic when symbol is placed. 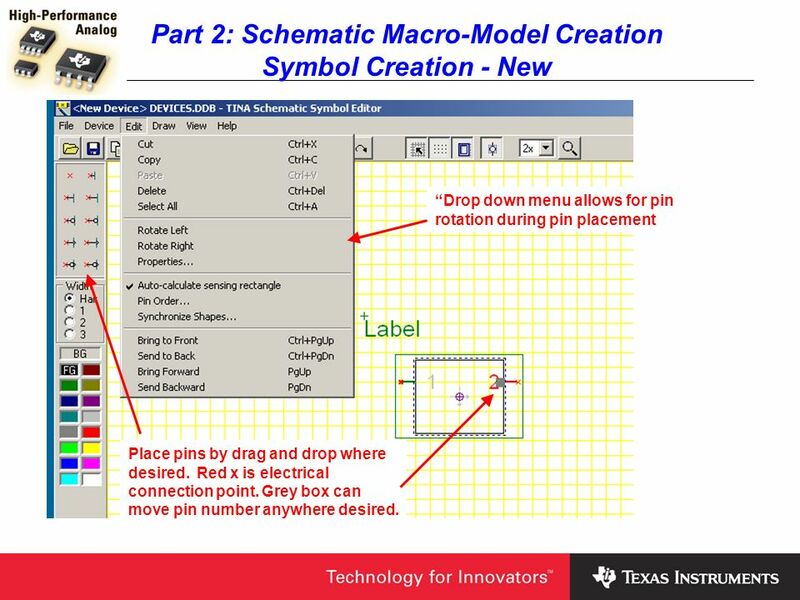 Symbol Creation - New “Drop down menu allows for pin rotation during pin placement Place pins by drag and drop where desired. 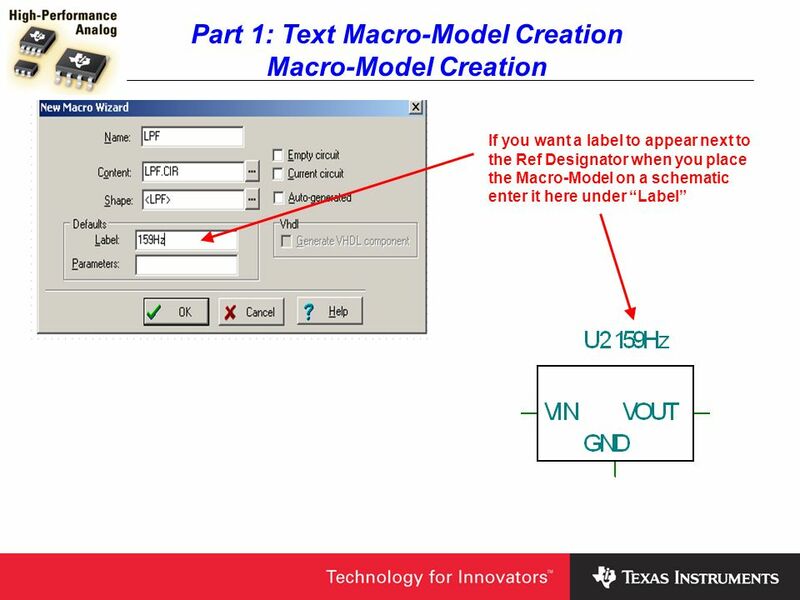 Red x is electrical connection point. Grey box can move pin number anywhere desired. 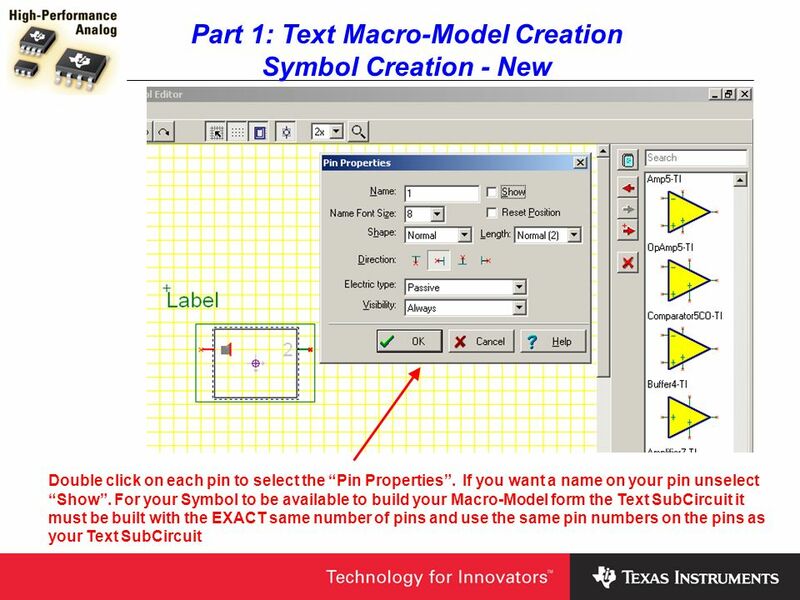 Symbol Creation - New Enter desired pin name here Click on “T” to create a text label for your symbol pin. 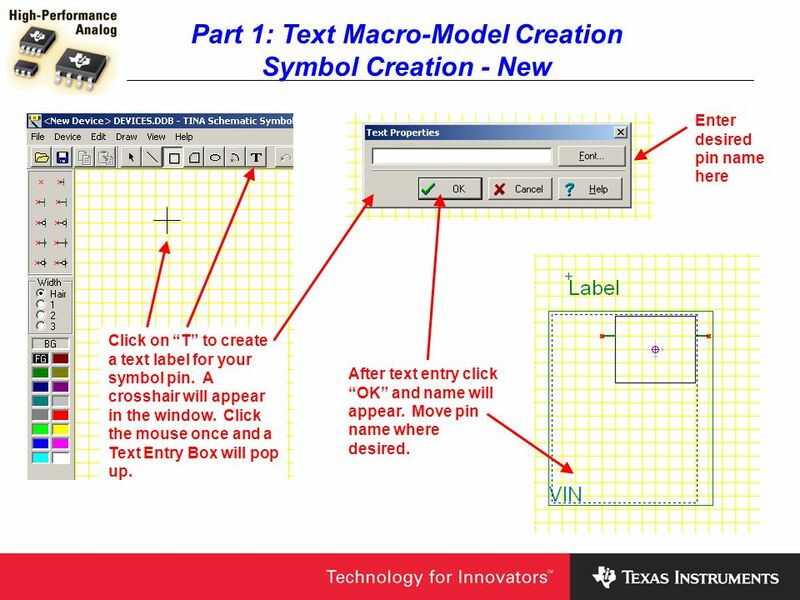 A crosshair will appear in the window. 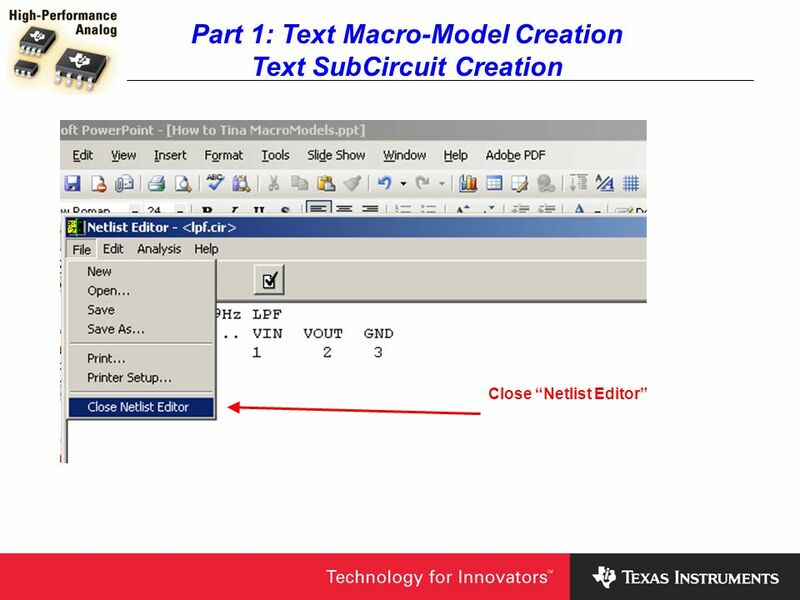 Click the mouse once and a Text Entry Box will pop up. After text entry click “OK” and name will appear. Move pin name where desired. 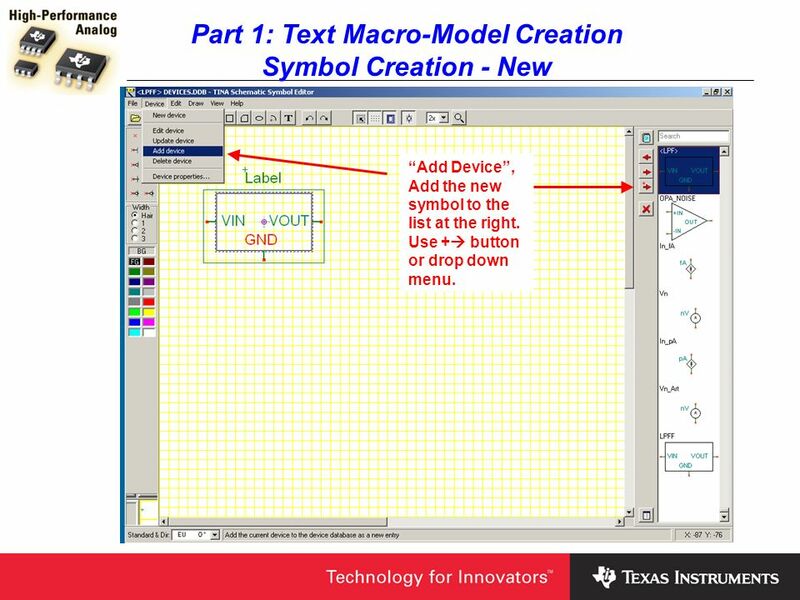 Symbol Creation - New 1 2 3 Hidden Pin Numbers * TG Simple 159Hz LPF *Connections..... VIN VOUT GND .SUBCKT LPF R k C u .ENDS LPF Ensure “Pin Order” matches the order in the Text SubCircuit. 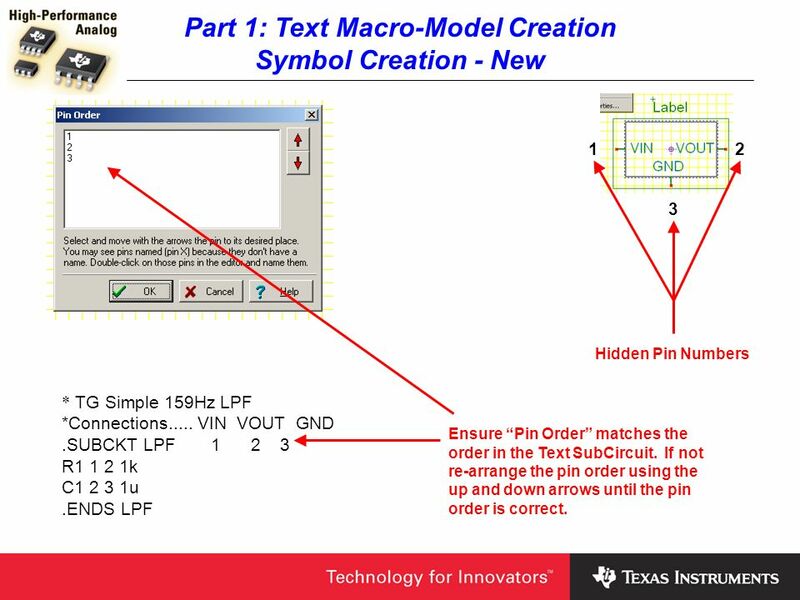 If not re-arrange the pin order using the up and down arrows until the pin order is correct. 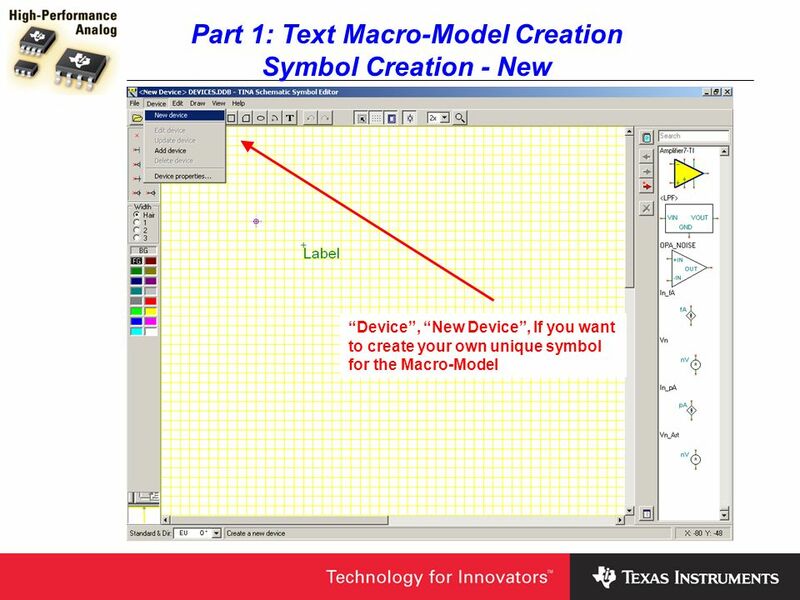 Symbol Creation - New “Add Device”, Add the new symbol to the list at the right. Use + button or drop down menu. Symbol Creation - New Save the updated Device Database as “DEVICES.DDB” Warning: Backup the original “DEVICES.DDB” File in case there is a problem. 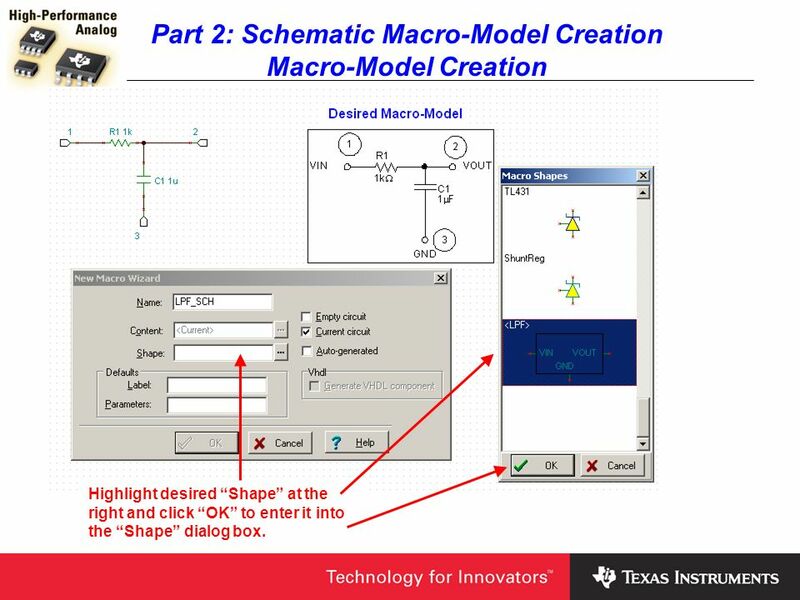 Click on “Shape”. 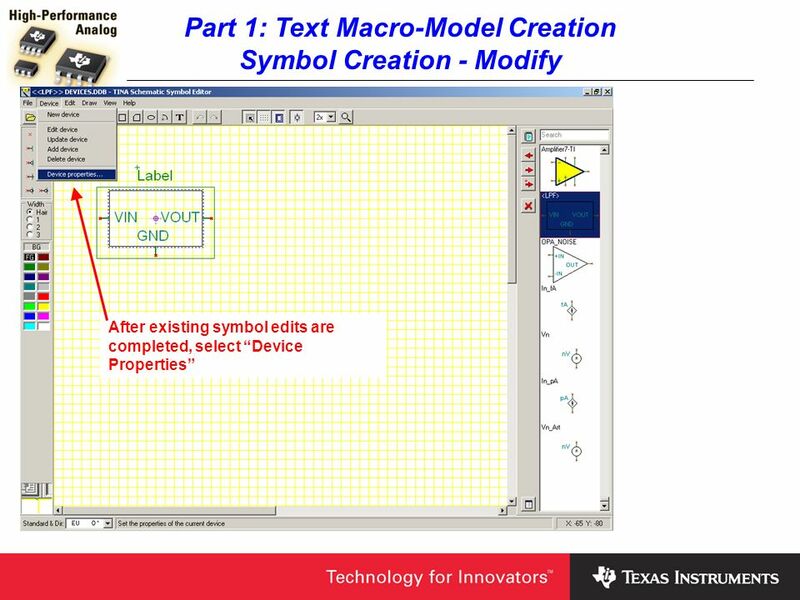 The ONLY symbol choices that will appear at the right are ones that contain pin numbers and quantities that EXACTLY match the Text SubCircuit. (i.e., 3 pins and pins numbered 1, 2, 3 corresponding to the Nodes in the Text Subcircuit of 1, 2, 3) Unselect all boxes since we want to use our own symbol for the Macro-Model. 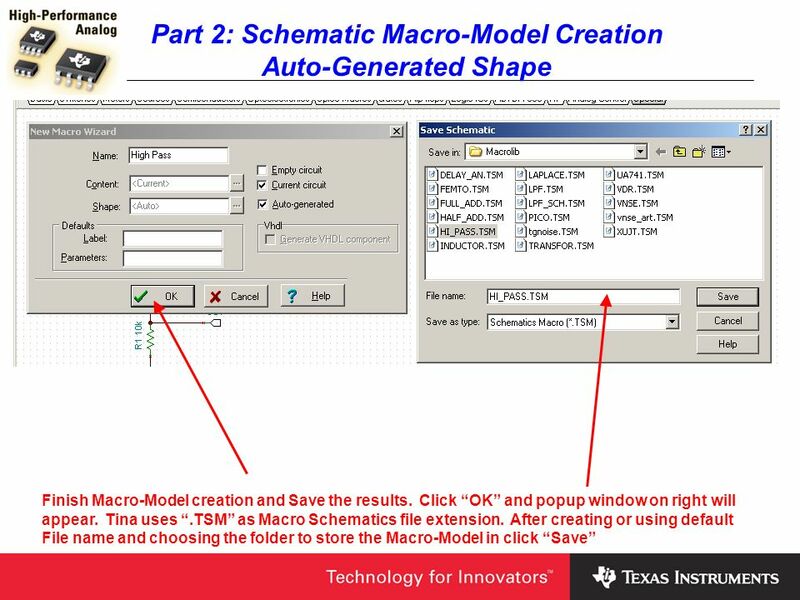 Highlight desired “Shape” at the right and click “OK” to enter it into the “Shape” dialog box. 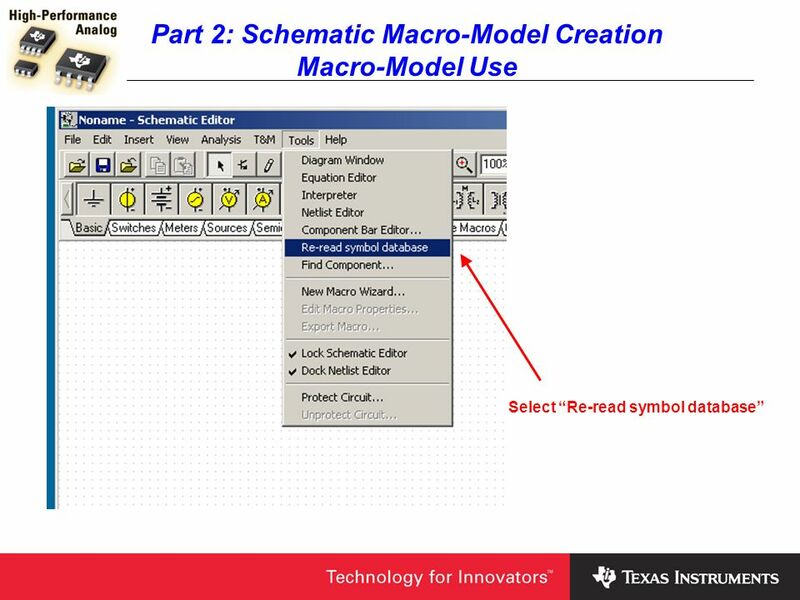 Macro-Model Use Now the Macro-Model may be connected and used in the Schematic Editor as a normal Macro-Model. 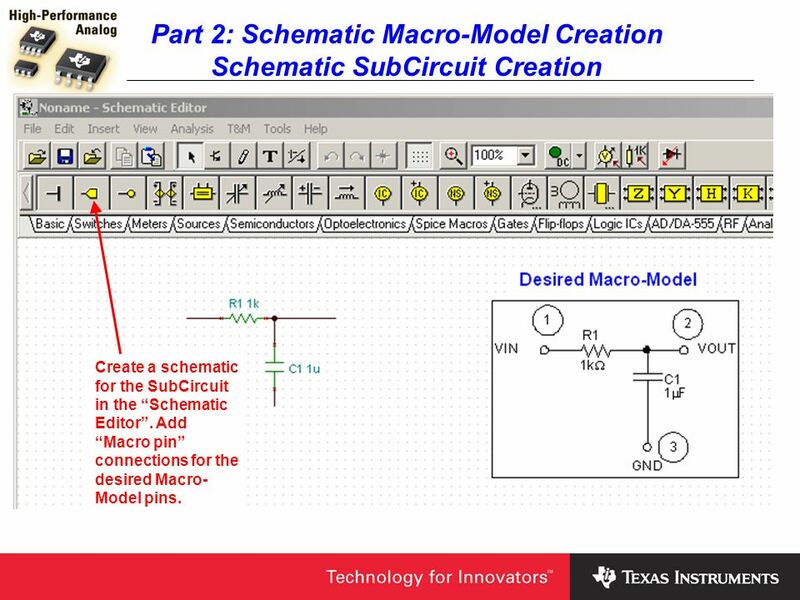 Create a schematic for the SubCircuit in the “Schematic Editor”. 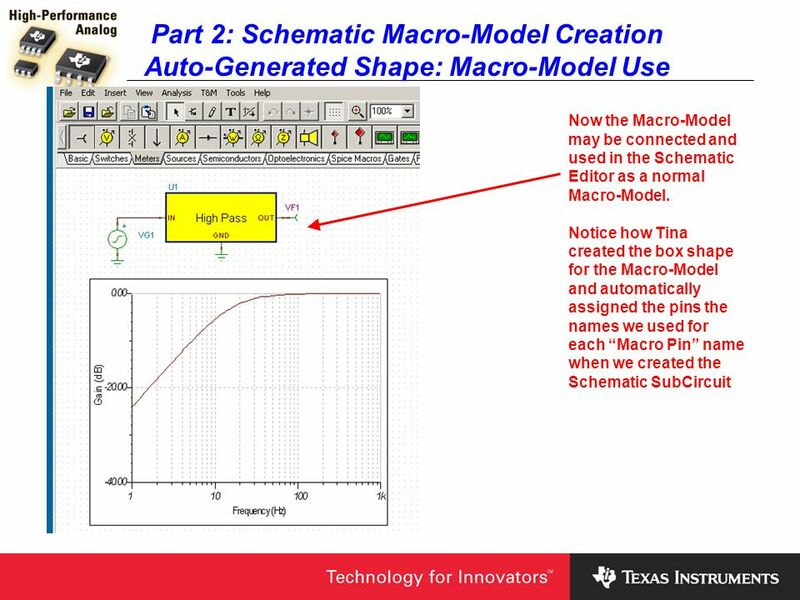 Add “Macro pin” connections for the desired Macro-Model pins. 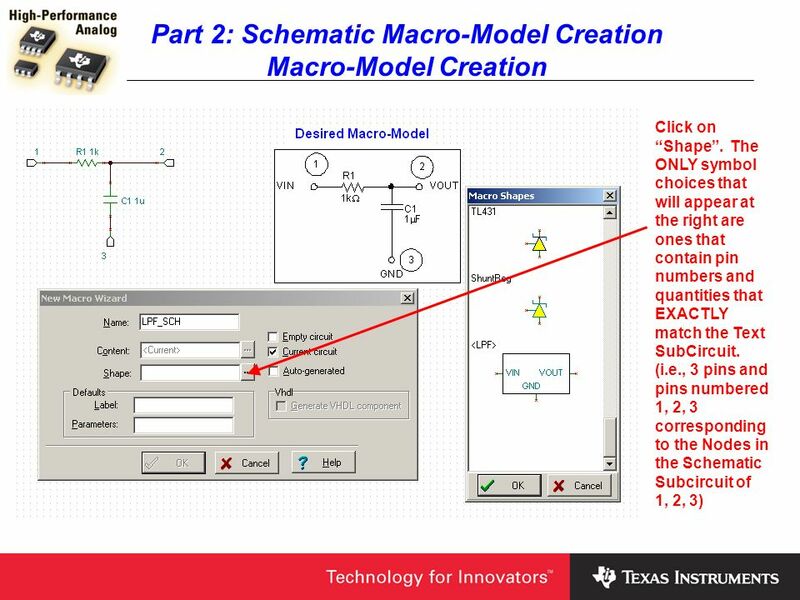 Double click on each “Macro pin” and type a desired pin number in the “Label” box. When completed click on “OK”. 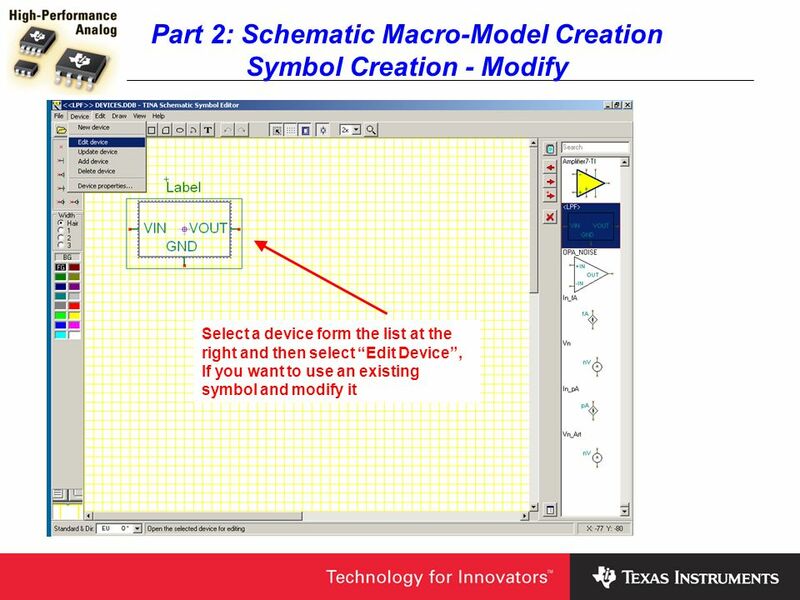 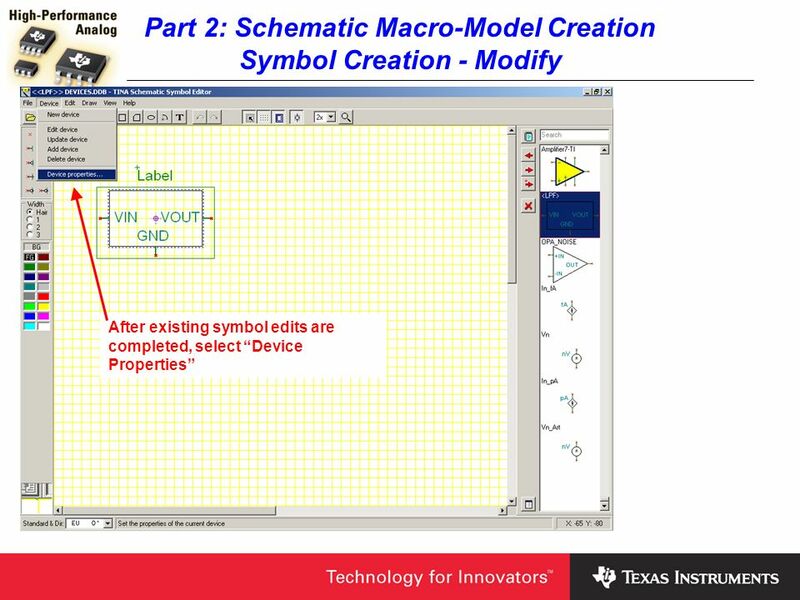 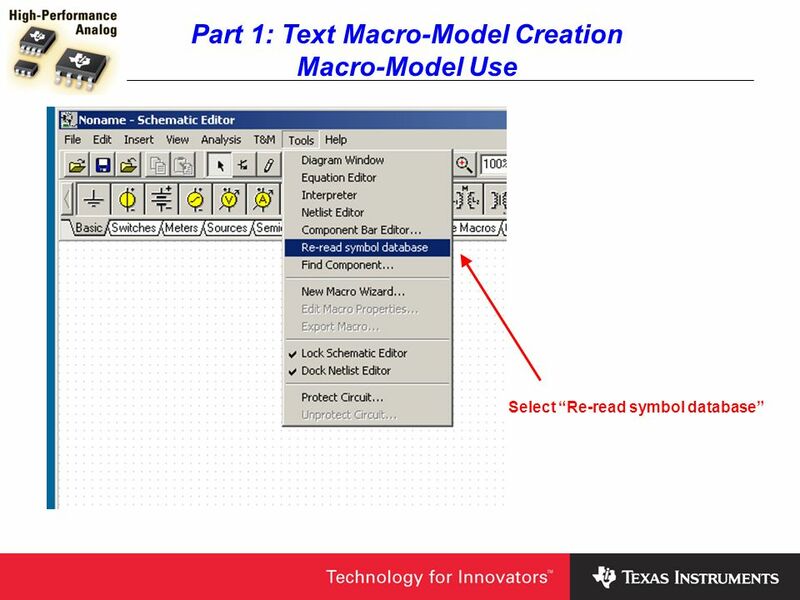 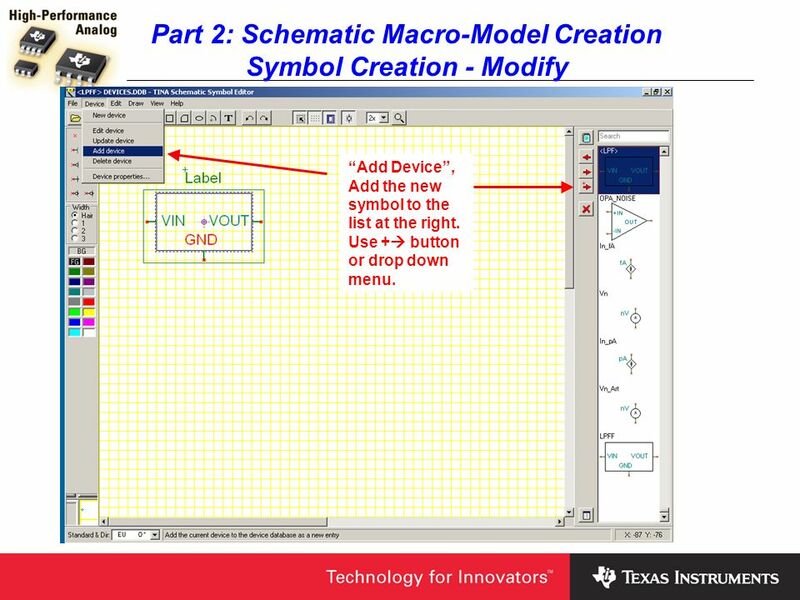 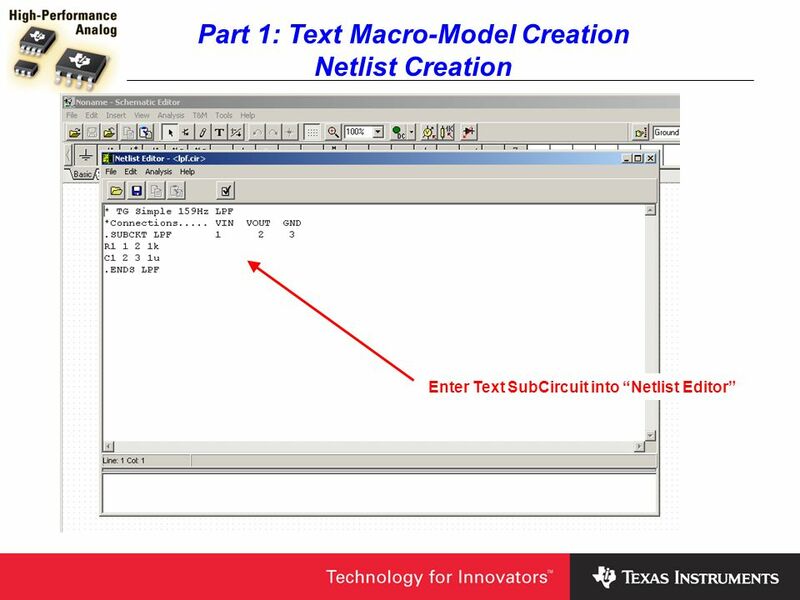 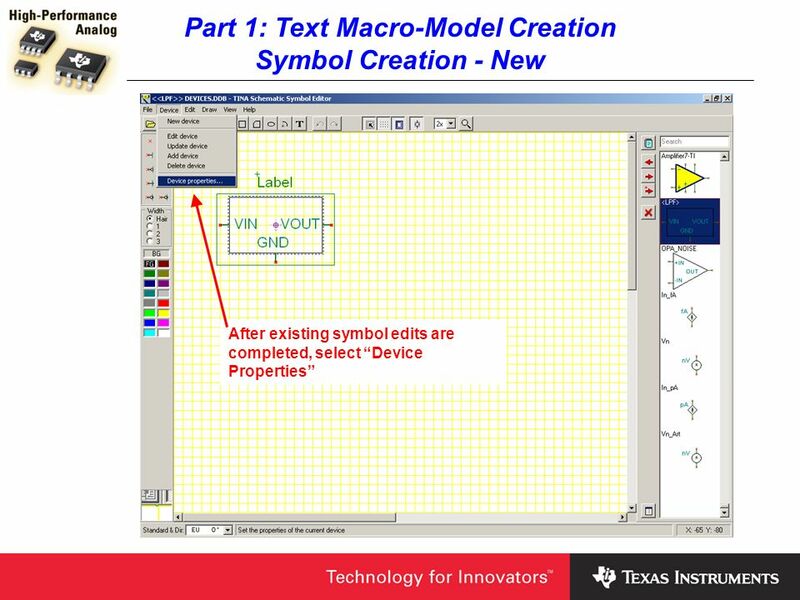 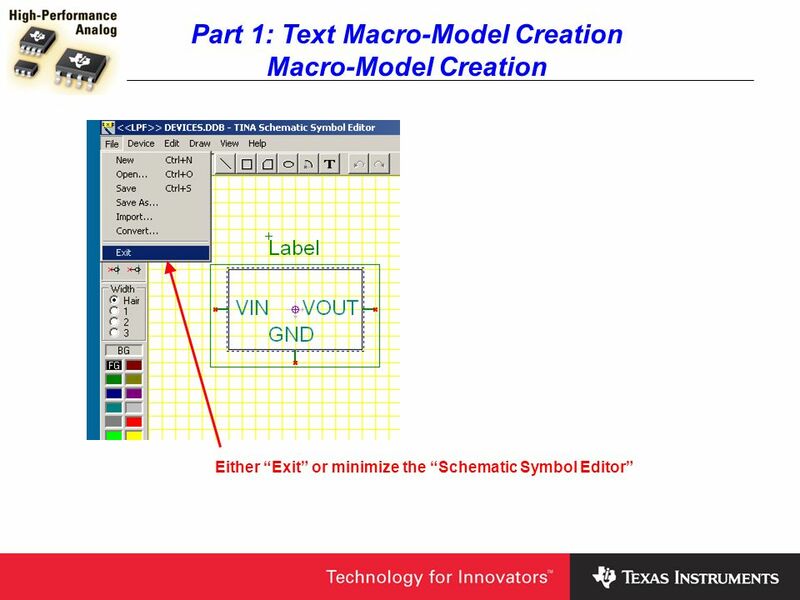 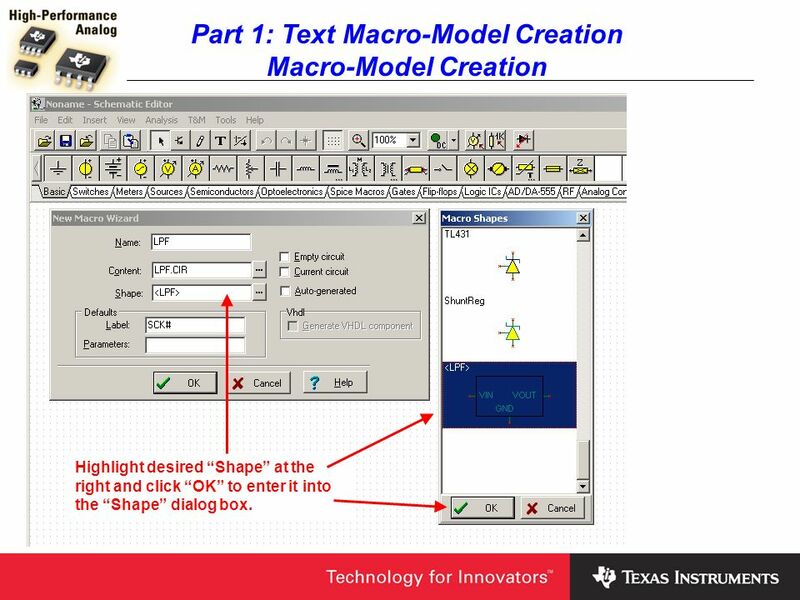 Part 2: Schematic Macro-Model Creation Symbol Creation - Modify “Add Device”, Add the new symbol to the list at the right. 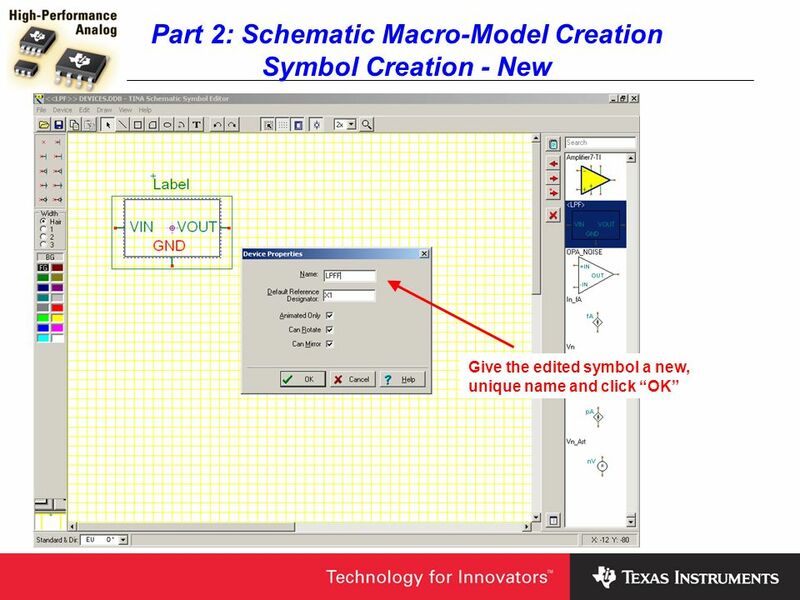 Use + button or drop down menu. Part 2: Schematic Macro-Model Creation Symbol Creation - Modify Save the updated Device Database as “DEVICES.DDB” Warning: Backup the original “DEVICES.DDB” File in case there is a problem. 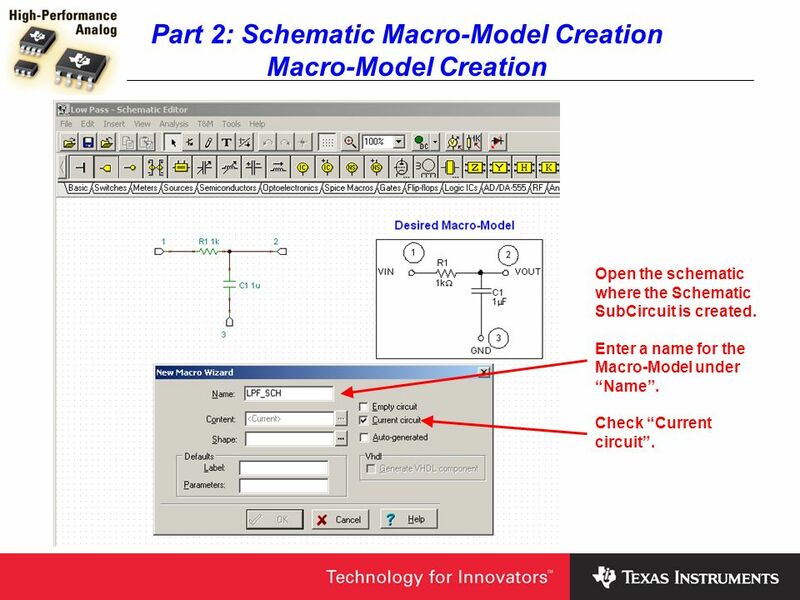 Open the schematic where the Schematic SubCircuit is created. 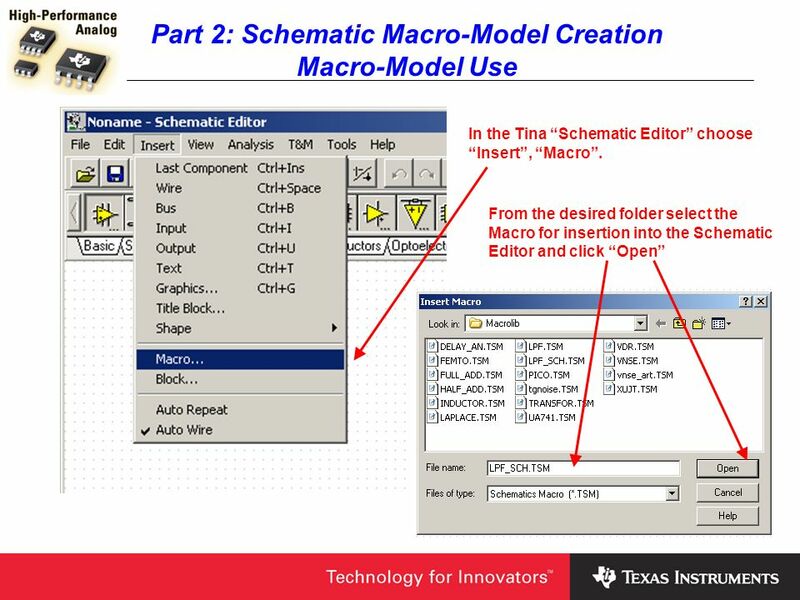 Enter a name for the Macro-Model under “Name”. 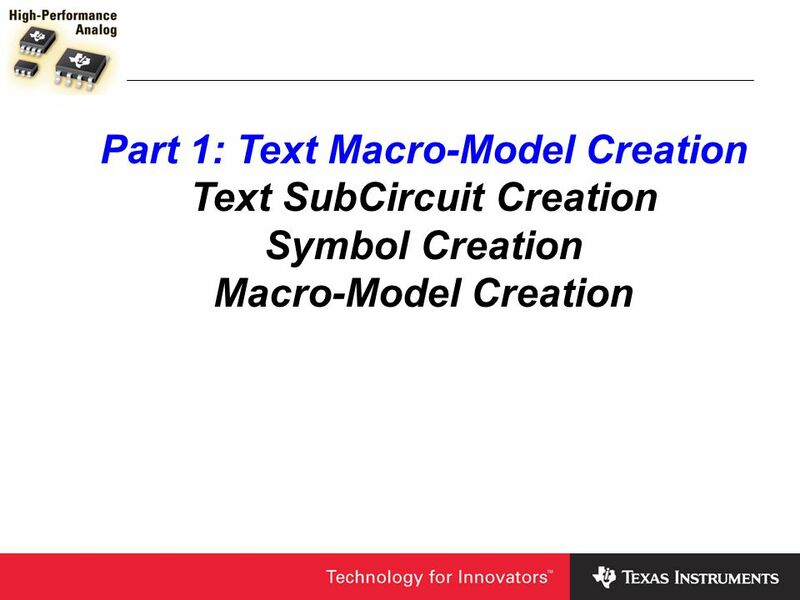 Check “Current circuit”. 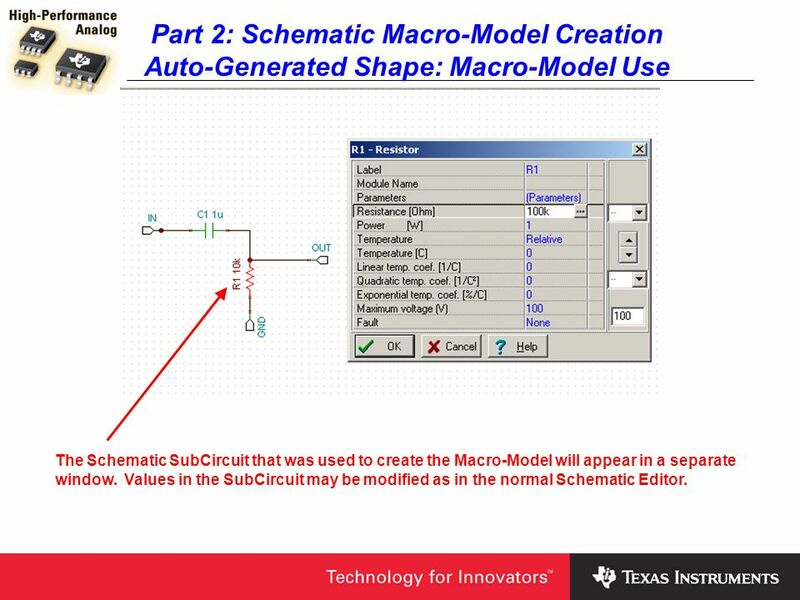 Auto-Generated Shape Create subcircuit in the Schematic Editor. 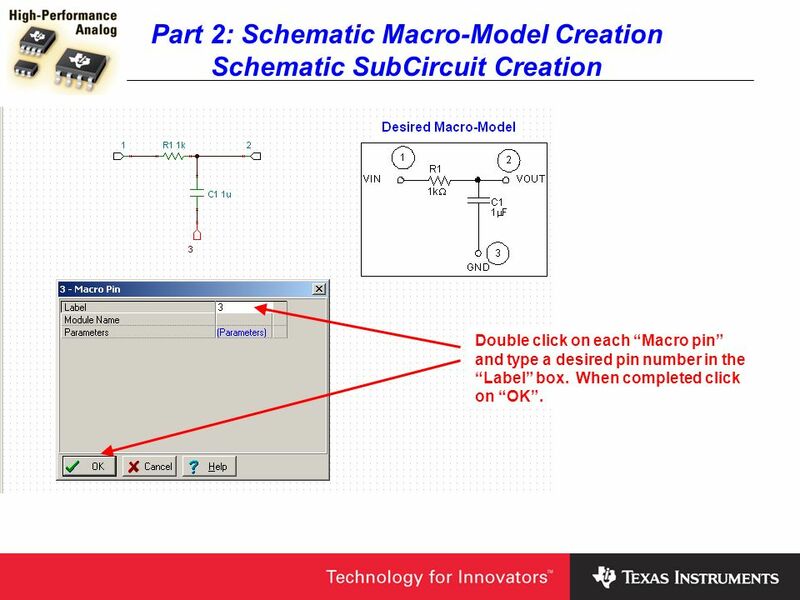 Connect a “Macro Pin” to each I/O of the subcircuit. 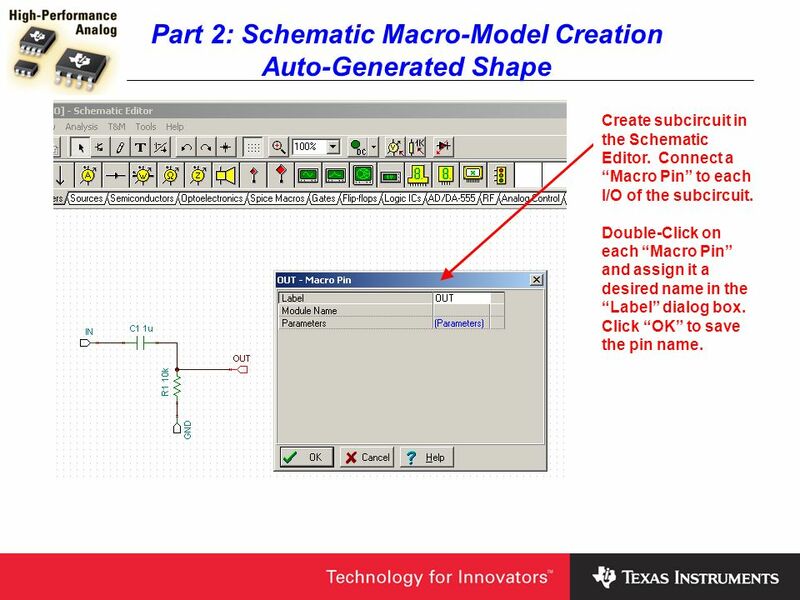 Double-Click on each “Macro Pin” and assign it a desired name in the “Label” dialog box. Click “OK” to save the pin name. 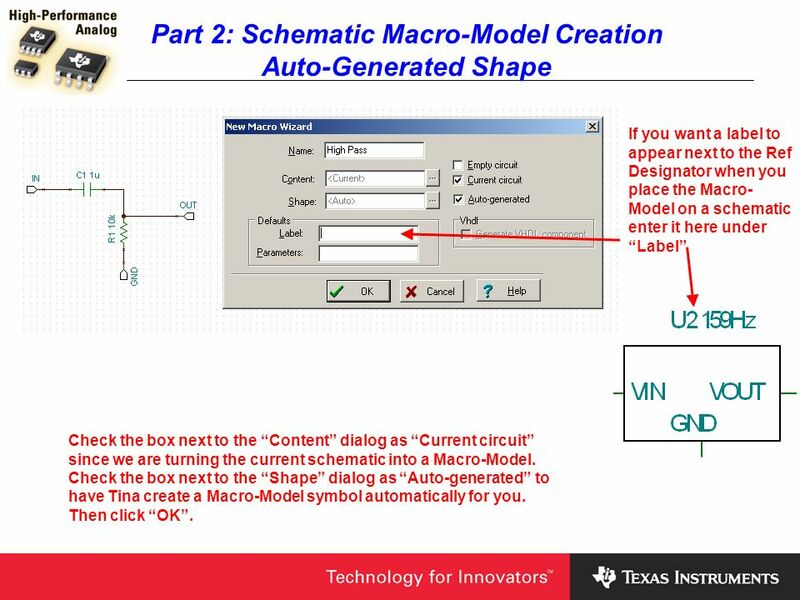 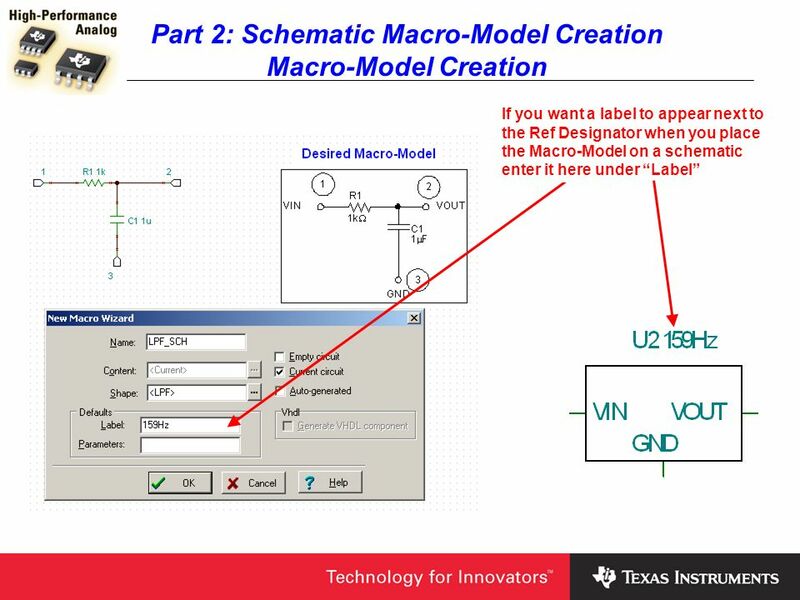 Auto-Generated Shape If you want a label to appear next to the Ref Designator when you place the Macro-Model on a schematic enter it here under “Label” Check the box next to the “Content” dialog as “Current circuit” since we are turning the current schematic into a Macro-Model. 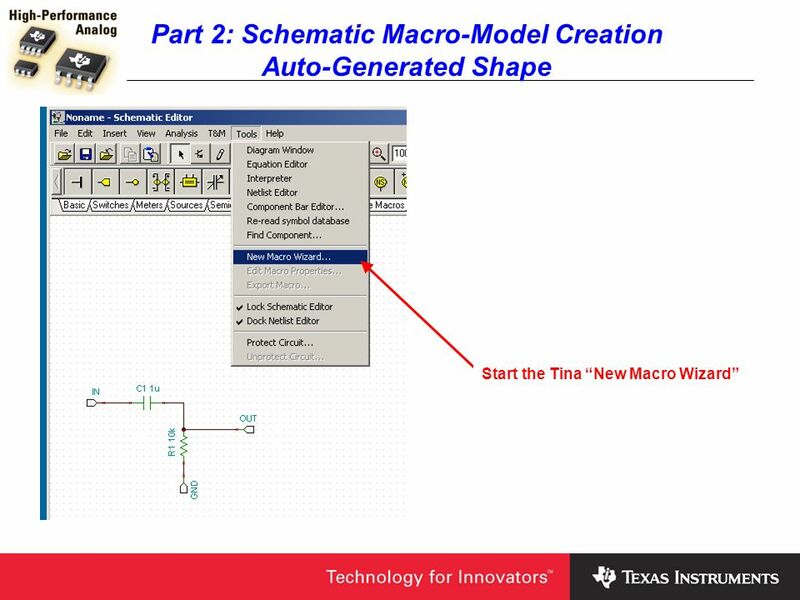 Check the box next to the “Shape” dialog as “Auto-generated” to have Tina create a Macro-Model symbol automatically for you. 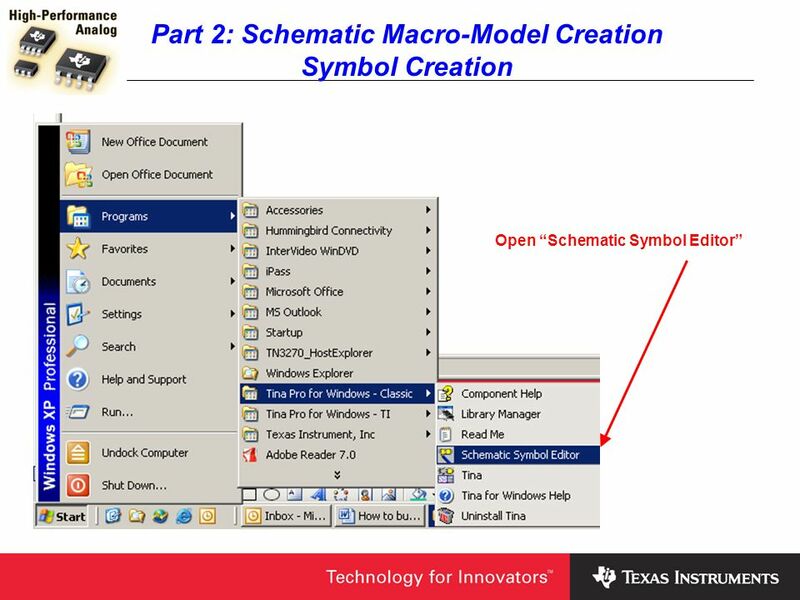 Then click “OK”. 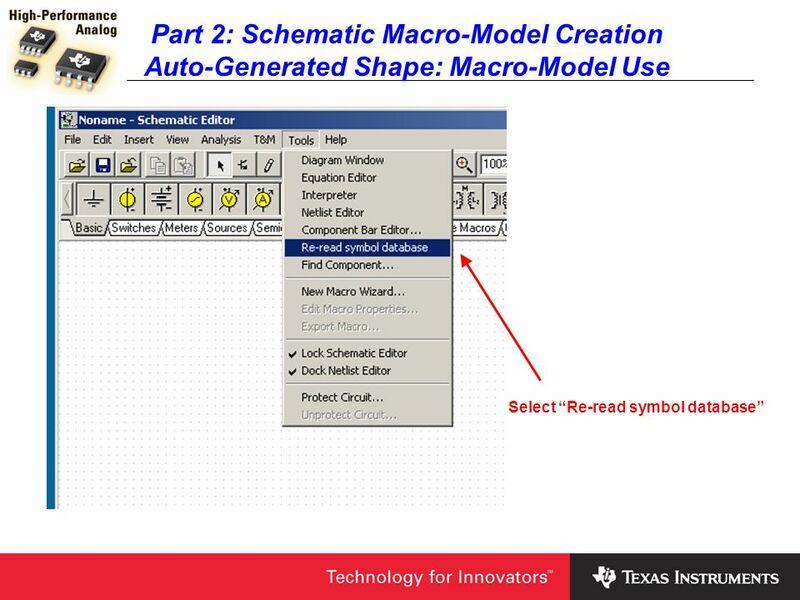 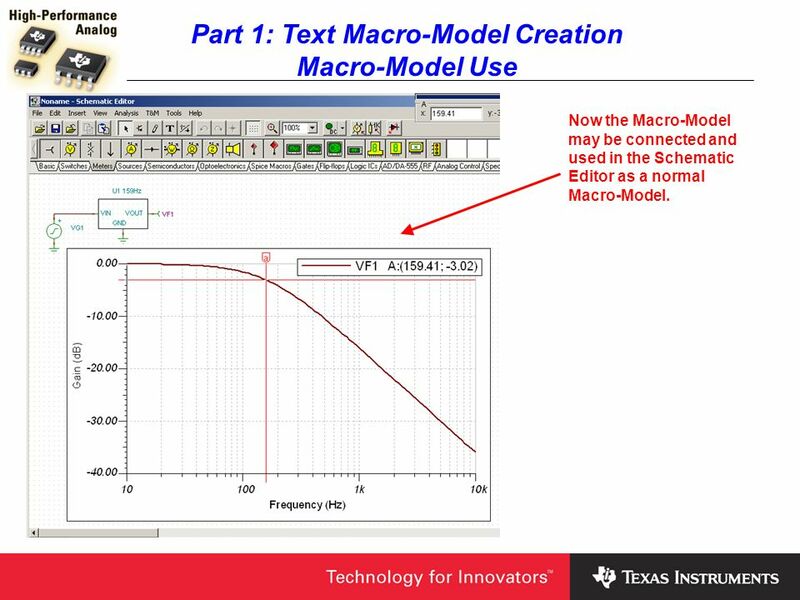 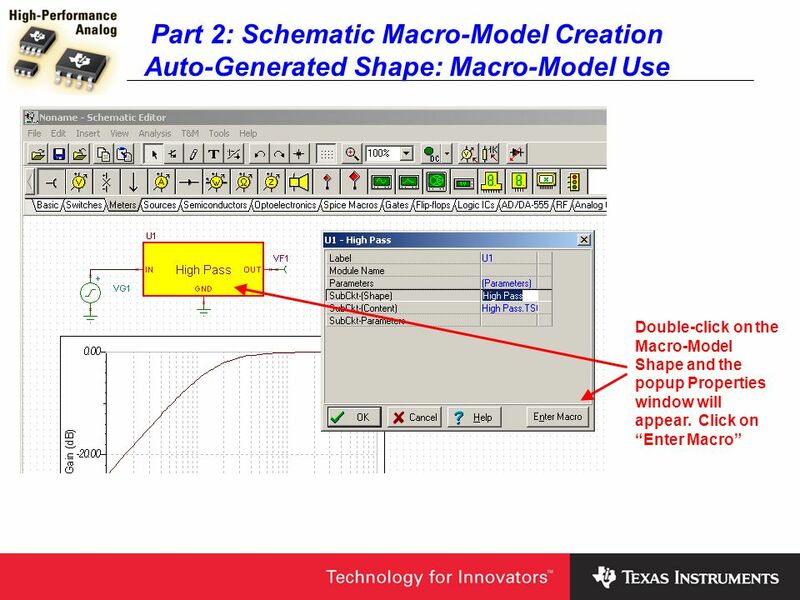 Part 2: Schematic Macro-Model Creation Auto-Generated Shape: Macro-Model Use The Schematic SubCircuit that was used to create the Macro-Model will appear in a separate window. Values in the SubCircuit may be modified as in the normal Schematic Editor. 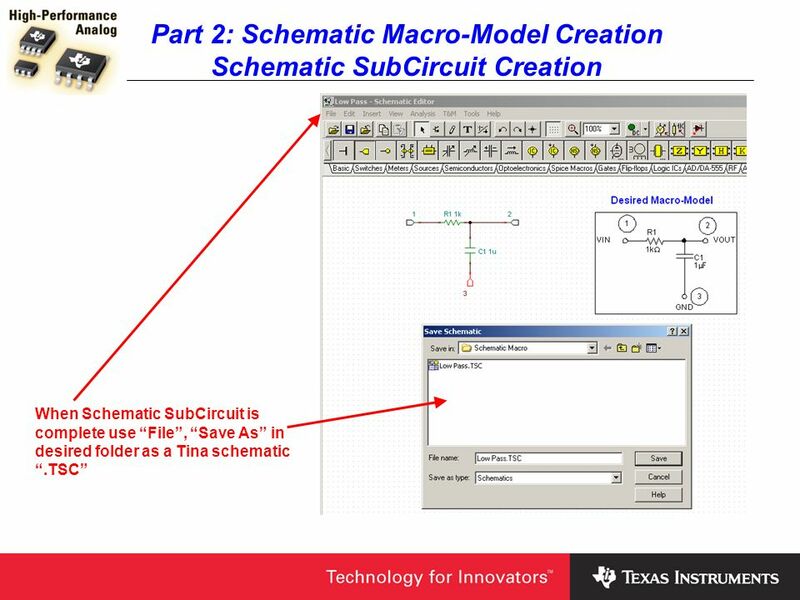 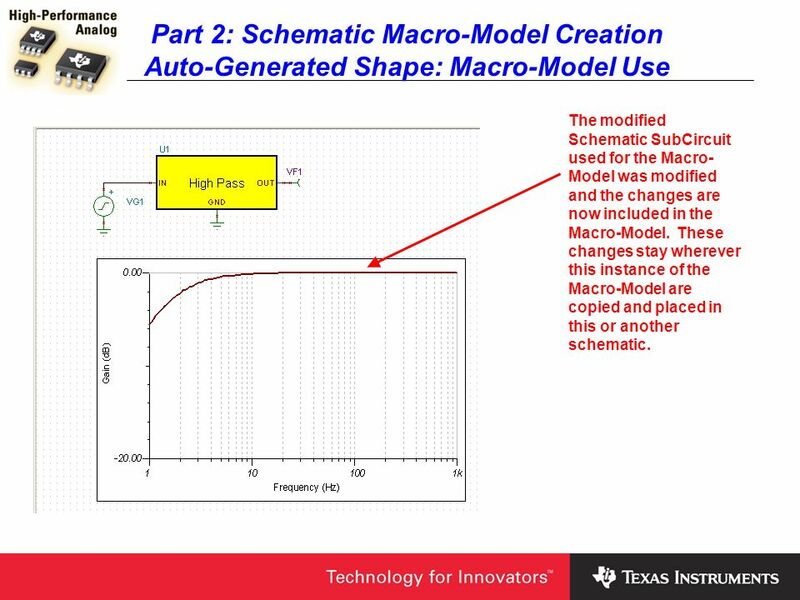 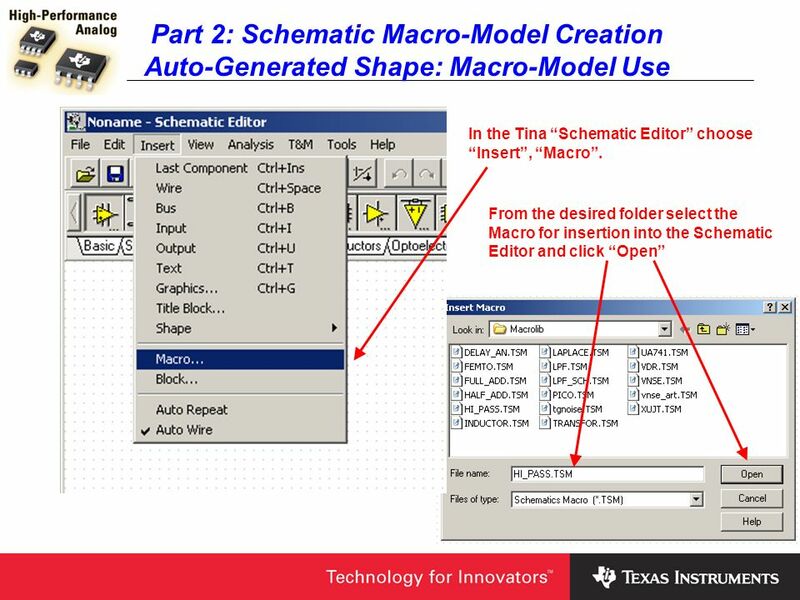 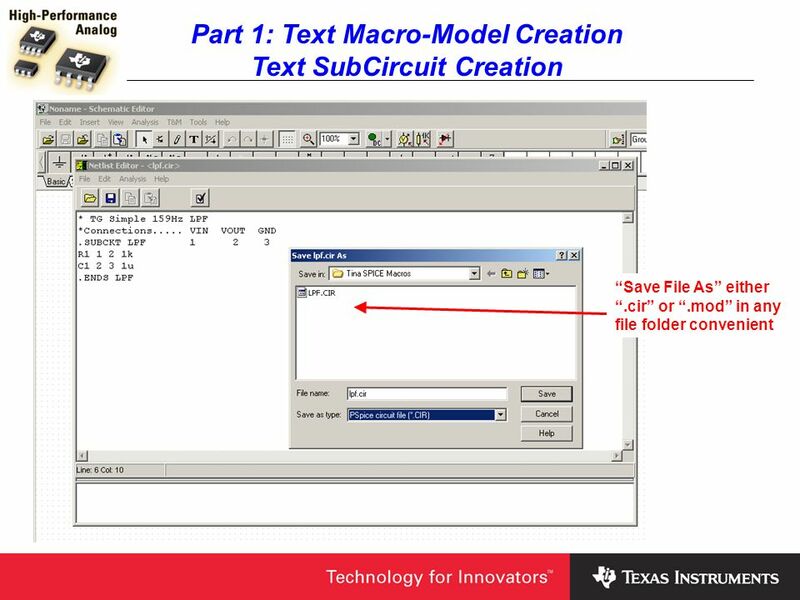 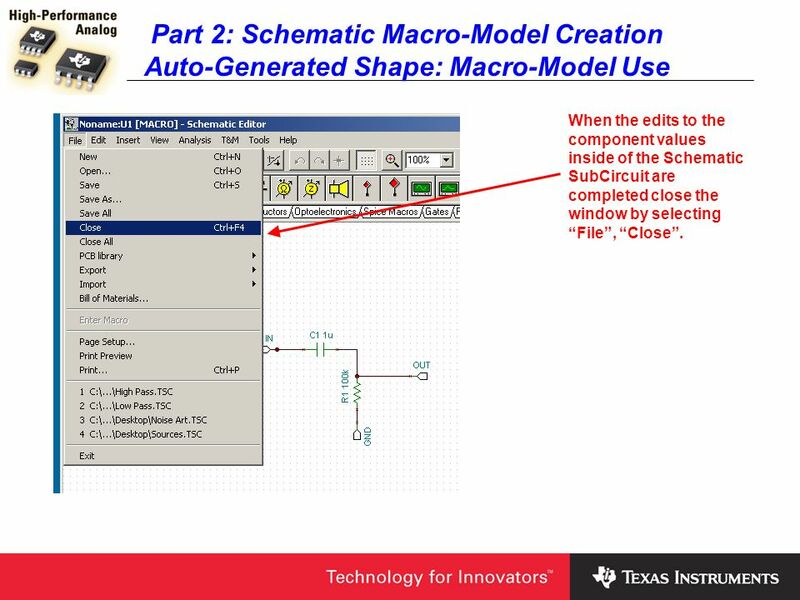 Part 2: Schematic Macro-Model Creation Auto-Generated Shape: Macro-Model Use When the edits to the component values inside of the Schematic SubCircuit are completed close the window by selecting “File”, “Close”. 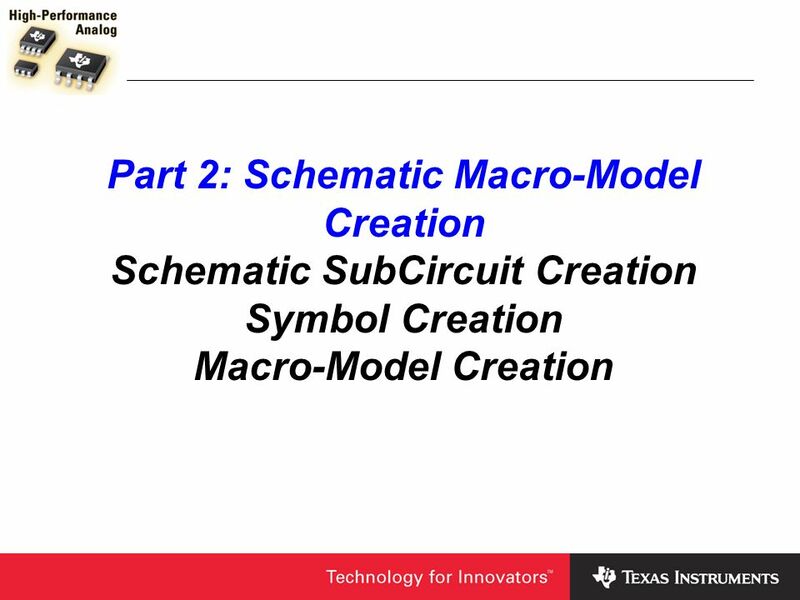 Part 2: Schematic Macro-Model Creation Auto-Generated Shape: Macro-Model Use The modified Schematic SubCircuit used for the Macro-Model was modified and the changes are now included in the Macro-Model. These changes stay wherever this instance of the Macro-Model are copied and placed in this or another schematic. 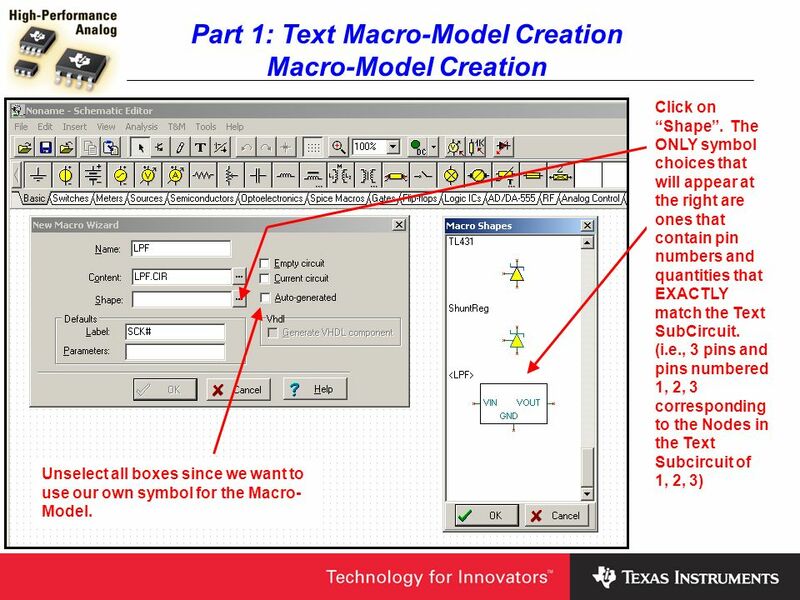 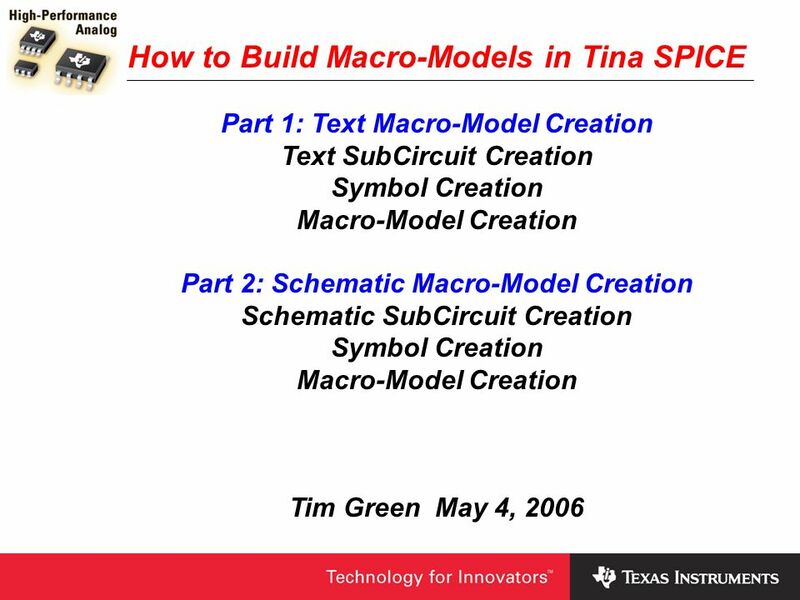 Download ppt "How to Build Macro-Models in Tina SPICE"
Getting Started with Layout Compiled by Ryan Johnson May 1, 2002  Open Orcad Capture under Engineering Software  Under FILE, choose NEW, PROJECT  The. 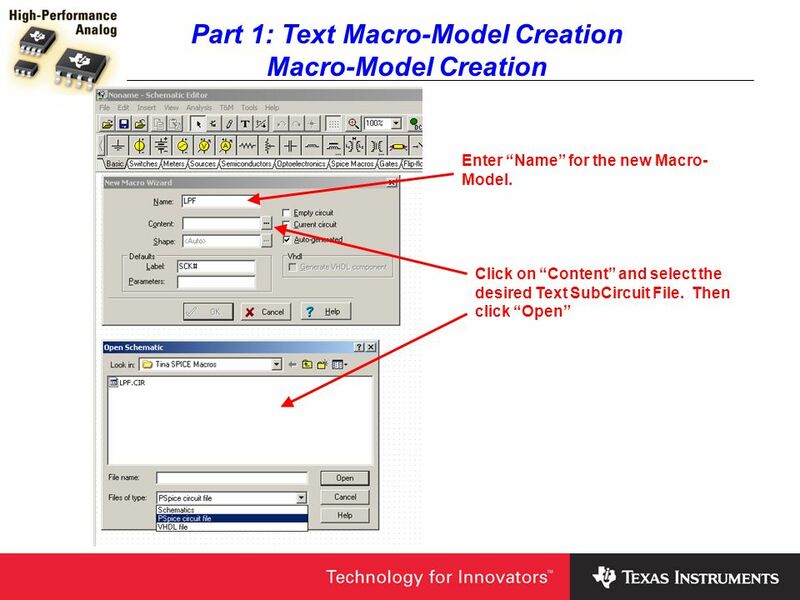 XP New Perspectives on Microsoft Office Access 2003, Second Edition- Tutorial 2 1 Microsoft Office Access 2003 Tutorial 2 – Creating And Maintaining A. 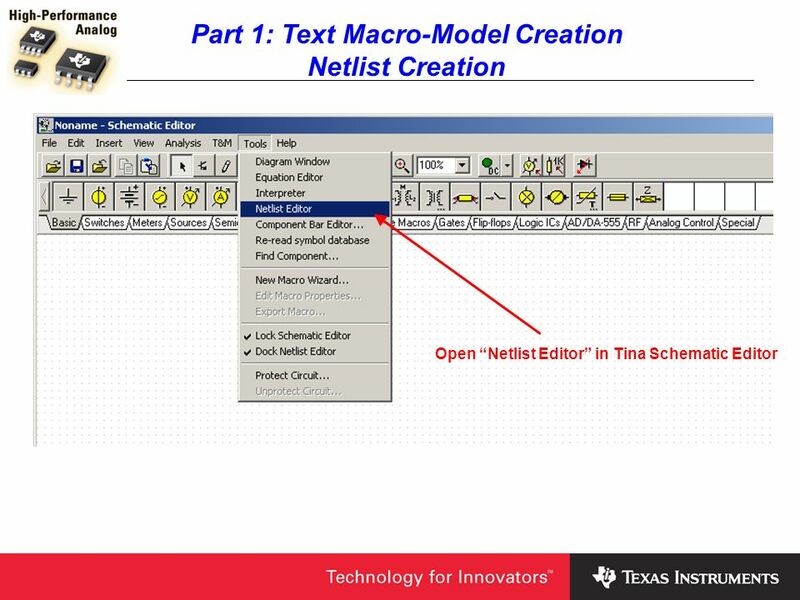 1 CA202 Spreadsheet Application Creating Dynamic Lists with PivotTables Lecture # 9. 1 Computing for Todays Lecture 17 Yumei Huo Fall 2006. 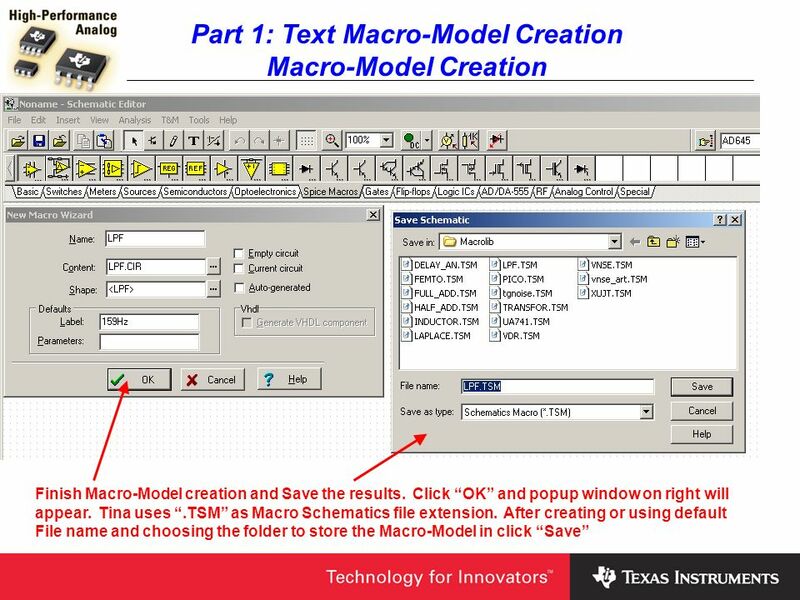 XP New Perspectives on Microsoft Office Excel 2003, Second Edition- Tutorial 11 1 Microsoft Office Excel 2003 Tutorial 11 – Importing Data Into Excel. 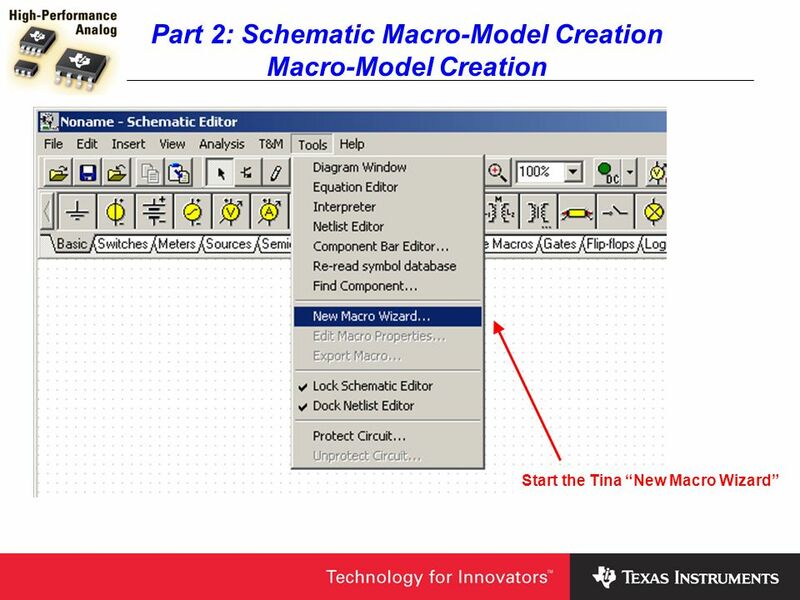 Creating And Maintaining A Database. 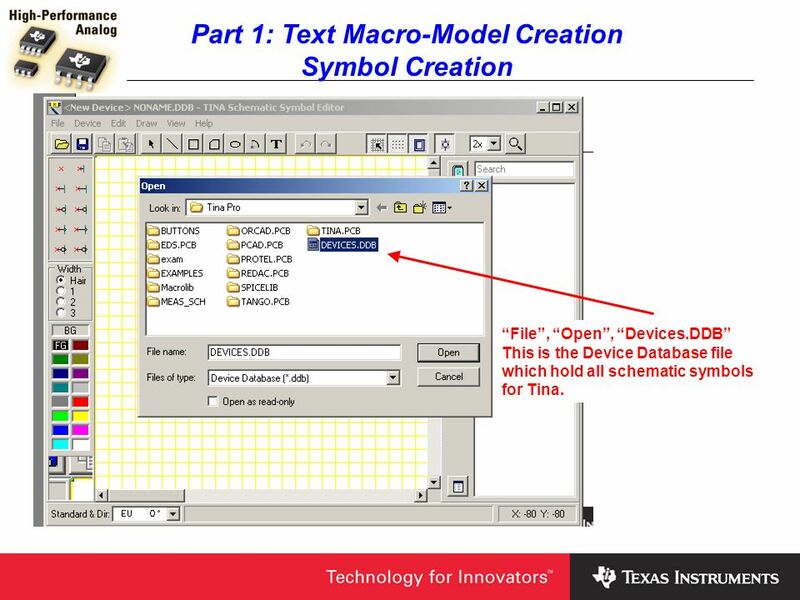 2 Learn the guidelines for designing databases When designing a database, first try to think of all the fields of.